In 1989 a group of students from Ellingson Hall who loved singing and wanted to make music together formed a small male a cappella ensemble they called the Limestones. Two decades later, the student-led group is still going strong, with multiple recordings and a dedicated fan base. Current members of the Limestones. "The support of our fans is one of the things that has held the group together," says current Limestone Charlie Stuckey '10. "Knowing that they still enjoy the music we make, even after 20 years, is what really keeps us going." The Limestones performed a spring concert May 13 in the Lion's Pause, where they introduced members of the 2009-10 ensemble. In addition to multiple performances each year, the Limestones also record in a studio every other year. 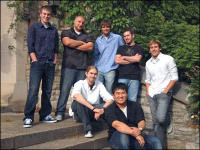 The group's latest CD is titled Fossilized. Remaining a presence on campus for two decades hasn't been easy, Stuckey notes. "As an entirely self-funded organization, we have relied heavily on the leadership, initiative, and dedication of our members," he says. "We are constantly looking for gigs wherever we can get them to help fund our operations. However, we enjoy the freedom that we have to set our own schedules and welcome the growing experience that comes with the challenge of running our own organization." After a rigorous audition process held each spring to find a few new members to fill the spots of graduating Limestones, the summer brings a week of 10-hour practice days at Camp Limestone to kick off the new academic year. Once classes begin, the Limestones meet three times a week to practice. As an organization that prides itself in community leadership and service, the Limestones stay involved by participating in things such as the Relay for Life, clinics encouraging children to stay involved in music, and bowling with their fans. The sound of the Limestones has changed over the years. The group originally sang mostly standards and doo-wop music. 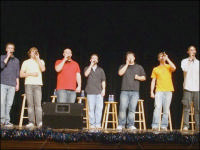 However, over the past few years the seven-voice group has incorporated vocal percussion and expanded their repertoire of songs into new genres. Now the Limestones sing a little bit of everything, including R&B, rock, country and pop. Retired Limestone Pete Hoffman '04 looks fondly on his time as a Limestone. "There is an endless assortment of organizations, projects, and extra-curricular activities at St. Olaf that allows one to grow personally and professionally," he says. "For me, it was the privilege of spending three years in the Limestones that helped shape who I am today." Hoffman now works in the business field with Hoffman LLC, a family firm that provides planning, architecture and construction management services with the goal of sustainability. Hoffman's job may not involve music, but he says the Limestones helped prepare him for it. "On the surface the group may appear merely as a fun hobby to do with friends. However, the Limestones is like a small business and teaches its members the basics of how a business works," Hoffman says. With new members each year and a three-year maximum term for membership, it's remarkable that the Limestones have stood the test of time. Second-year Limestone Stuckey credits the camaraderie of the group and the faithful fans as the glue that has held the Limestones together. "For me, singing with the Limestones has been the most enjoyable part of my college experience," Stuckey says. "I get to sing the kind of music that I like, while hanging out with six of my best friends on campus. The camaraderie within the group has been a tradition the Limestones have been truly blessed with."